Tuesday, November 23rd, 2010 by Oli Studholme. For those who like (to argue about) semantics, HTML5 is fantastic. Old presentational elements now have new semantic meanings, there’s a slew of new semantic elements for us to argue about, and we've even in<cite>d a riot or two. But that's not all! Also in HTML5 is microdata, a new lightweight semantic meta-syntax. Using attributes, we can define nestable groups of name-value pairs of data, called microdata, which are generally based on the page’s content. It gives us a whole new way to add extra semantic information and extend HTML5. Microdata has been somewhat controversial and so is a separate specification at W3C, but it's still part of the WHATWG HTML specifications. Keep calm and carry on. itemtype="" — defines the item’s type when used on the same element as itemscope. The itemtype value is a URL that acts as an identifying vocabulary name. itemid="" — allows a vocabulary to define a global identifier for a microdata item, for example an ISBN number on a book. Use itemid on the same element as the item’s itemscope and itemtype attributes. Let’s go through these new attributes and see how to use them in practice with everyone’s favourite example band, Salter Cane. <p itemscope>I’m going to the <span itemprop="name">Salter Cane</span> gig next week. The presence of itemscope on the <p> element makes it into a microdata item. The attribute itemprop on a descendent element defines a property of this item (in this case, name) and associates it with the value Salter Cane (the <span>’s content). An item must have at least one itemprop to be valid. itemprop names can be words or URL strings. Using URLs makes the name globally unique. If you use words, it’s best to use a vocabulary and the names defined in the vocabulary, which also makes the names unique. We cover this in the section Typed items and globally unique names. For some elements, an itemprop’s value comes from an attribute of the element, not the element’s text. This applies to values from attributes containing URLs, the datetime attribute, and the content attribute. <p itemscope>I’m going to the <a itemprop="url"
This defines an item with the properties url and date containing the values http://www.saltercane.com/ and 2010-07-18, respectively. Similarly, the <time> element’s value is 2010-07-18 and not its text content (i.e., “next week”). This defines an item with three properties: the url is http://www.saltercane.com/, the name is Salter Cane, and the date is 2010-07-18. We’ll return to the <meta> element’s content attribute in just a moment. We can make a property into a nested item by adding itemscope to an element with itemprop. Cane</span> drummer is <span itemprop="members"
This defines an item with two properties, name and members. The name is Salter Cane, and the members is a nested item, containing the property name with the value Jamie Freeman. Note that members doesn’t have a text value. Items that aren’t part of other items (i.e., anything with itemscope but not itemprop, or the child of an element with itemprop) are called top-level microdata items. 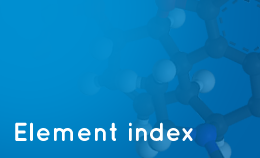 The microdata API returns top-level microdata items and their properties, which includes nested items. This defines the property name with four values, Chris Askew, Jeremy Keith, Jessica Spengler and Jamie Freeman. This defines the properties guitar and vocals, both of which have the value Chris Askew. Items can use non-descendant properties (name-value pairs that aren’t children of the itemscope element) via the attribute itemref="". This attribute is a list of the IDs of properties or nested items elsewhere on the page. <p>Salter Cane are <span id="band-members"
This defines the properties url, name, and date. Additionally, it references the ID band-members, which contains the item members with four name properties, each of which have a different value. If the text you want to add isn’t already part of the page’s content, you can use the content attribute on the <meta> element (<meta itemprop="" content="">) to add it. Unfortunately, some current browsers move <meta> elements into the document's <head>. The elegant workaround is to use an in-page reference via itemref, so it’ll be included by tools that understand microdata even if the browser has moved it. Both of these code snippets define the property name with the value Jessica Spengler and the nested property likes with the value Mameshiba. Note that there’s no relationship between microdata and the page’s content. Adding all microdata via <meta> or adding metadata using only the page’s content are equivalent, and both give the same output via the microdata API. While microdata is best suited for annotating your existing content, by using <meta>-based or hidden values, microdata doesn’t have to be tied to a page’s content. In general, adding hidden content to a page is a bad idea. It’s easy to forget about and not keep up-to-date. If the information would be useful to some users, add it to the page’s content. If it’s inconvenient to add the content inside an item, consider putting it in a <footer> and including via an in-page reference. We can tie an item to a microdata vocabulary by giving it a type, specified via the attribute itemtype="" on an element with itemscope. The itemtype="" value is a URL representing the microdata vocabulary. Note that this URL is only a text string that acts as unique vocabulary identifier — it doesn’t actually need to link to an actual webpage (although it’s nice when it does). After doing this, we can use names in the vocabulary as itemprop names to apply vocabulary-defined semantics. This example defines the property url with the value http://saltercane.com/ and the property name with the value Salter Cane according to the http://schema.org/MusicGroup vocabulary (MusicGroup is a specialised kind of Organization vocabulary on schema.org). Alternatively, you can use URLs for itemprop names. In this case, there’s no need to use itemtype as the vocabulary information is already contained in the name. These are referred to as globally unique names. While vocabulary-based names must be used inside a typed item to have the vocabulary-defined meaning, you can use a URL itemprop name anywhere. This allows you to use multiple vocabularies in the same code snippet, even if they use the same property names. Sometimes an item may be identified by a unique identifier, such as a book by its ISBN number. This can be done in microdata using a global identifier via the attribute itemid="", if specified by the vocabulary. itemid can only appear on an element with both itemscope and itemtype="", and must be a valid URL. This defines an item containing information about a book identified by the ISBN number 0321687299, as long as the http://vocab.example.com/book vocabulary defines global identifiers like this. This example uses a theoretical example from the spec, as schema.org Book vocabulary currently only defines ISBN as an itemprop, although they’ve mentioned plans to add itemid global identifiers to their vocabularies in the future. Global identifiers are defined for the WHATWG vocabularies for vCard and vEvent, with values like UID:19950401-080045-40000F192713-0052 and UID:19970901T130000Z-123401@host.com respectively. So now that we know how, why would we want to use microdata? While microdata is machine-readable without needing to know the vocabulary, using a vocabulary means others can know what our properties mean. This allows the data to take on a life of its own. Say what? Well, in effect, using a vocabulary makes microdata a lightweight API for your content. On July 21st 19:00 - 20:00 at Apple Ginza, Oliver Reichenstein, CEO of iA, will share the lessons they’ve learned while creating three iPad apps and one iPad website. Now we could start making up our own itemprop names on an ad-hoc basis, but this effectively prevents anyone else from using our data. By using a vocabulary and following its rules, others can also use our data. It’s a good idea to use a vocabulary, so where do we find one? 2011-08-16 The schema.org vocabularies have now superseded the old Google vocabularies, so I’ve updated the article to reflect this. They’re the cross-search engine successors to Google’s earlier Rich Snippets vocabularies. Unlike Rich Snippets, which came in microformats and RDFa versions, schema.org vocabularies controversially only support microdata at the moment. So we now have a semantic association between a company and a URL and between a person and a URL. With the right tool, we could add this information to an address book automatically. A code sample with microdata describing an event (ref: standalone file). Adding the microdata attributes doesn’t change how the HTML is displayed. While these itemprops will probably be self-explanatory, you can see descriptions of what each itemprop means on the Organization, Person, and Event vocabulary pages. The summary (linked to the event URL) and the date and venue are included. Nice! Just by using a vocabulary, Google (or a script supporting microdata) can discover lots of useful data about our event without needing one of those pesky natural language interpreters (otherwise known as humans). Anyone who has used microformats before will also notice these vocabularies look very similar to hCard and hCalendar, although there are a couple of name changes — e.g., hCalendar’s class="dtstart" becomes itemprop="startDate". These vocabularies support microformats and RDFa, two other ways to add extra semantics to our content, in addition to microdata. Apart from this difference, they’re basically identical to the matching schema.org vocabularies, except they use www.data-vocabulary.org instead of schema.org in the itemtype. While Google still supports them, the newer schema.org offers more vocabularies that are also supported by Bing and Yahoo, so choose schema.org vocabularies as long as you’re happy with microdata. You might still want to check out the Rich Snippets documentation, as it includes code samples and is generally better than schema.org’s at the time of writing. If you’re familiar with microformats or want more properties than Google’s vocabularies, the WHATWG HTML5 specification actually contains microdata vocabularies for both the vCard and vEvent specifications that hCard and hCalendar are based on, plus a licensing vocabulary. Currently, search engines don’t map these vocabularies to schema.org ones. It’s possible they will at some stage, so decide which vocabularies to use based on what information you want to mark up, as the data is accessible regardless. For common semantics on the web … microformats are still simpler and easier than microdata, and are already well implemented across numerous services and tools. Personally, I think the difference is marginal. If you use the recommended microformat profile links, I’d say it’s a wash. (But of course no one does ;). Microdata is actually simpler to use for date/time data than the microformat equivalents (although it is less permissive for fuzzy or ancient antiquity times), and it's more explicit, for example, avoiding the internationalisation issues of the “implied fn optimisation”. Tool support is a valid concern, but again I expect this to change over time — microdata is relatively new after all. The microdata specification describes the microdata DOM API, which allows us to access top-level items and their properties. Unfortunately, no browser supports this yet. Opera has experimental support in their latest snapshot, with support expected in Opera 12. It’s also being implemented by Mozilla. But that’s okay because this data is still useful for search engine robots and third party tools. For example, Bing, Google, and Yahoo are using microdata with the schema.org vocabularies in search results. Live Microdata converts microdata into JSON. If you’re using WHATWG/microformats.org vocabularies for vCard or vEvent, it also produces vCard and iCal output. The PHP Microdata library allows you to parse microdata in an HTML file, returning JSON or a PHP array. Mida allows you to extract microdata as JSON, and search for or inspect items. It supports defining vocabularies, and includes schema.org vocabularies. You can even use it from the command line. Until there is native API support in browsers, we can use these libraries to access microdata. For example, you could put microdatajs on your own server to provide vCard and iCal file downloads, to allow adding the data to an address book or calendar app. Validator.nu will validate your use of microdata, but not whether it conforms to a vocabulary. Google’s Rich Snippets testing tool also validates microdata. 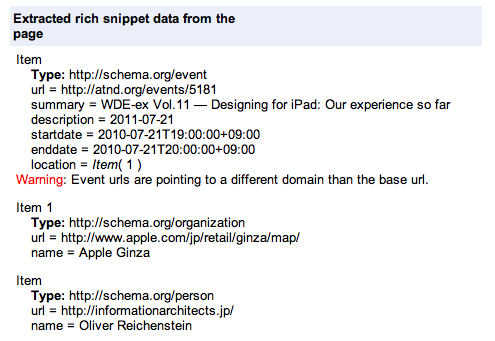 In addition, if you’re using the schema.org or Rich Snippets vocabularies it should display how that data could be incorporated into search results, as we saw in the Using schema.org vocabularies examples above. At the time of writing it isn’t, possibly due to this tool being updated for schema.org vocabularies. If you have valid microdata in these vocabularies search engines will understand that data, but currently you have to “register your interest” in having your rich snippets actually be displayed (more information). For CMSs, there’s a Schema for WordPress plugin, and initial work on adding microdata to Drupal too. It’s also possible to use RDFa vocabularies by both specifying the itemtype and using URLs for itemprop names. Refer to schema.rdfs.org for Linked Data versions of schema.org vocabularies, and the RDF vocabulary clearing-house (“namespace lookup”) http://prefix.cc. Work out your vocabulary’s rules. This is a little like setting up a database — work out names for each type of data, then think what kind of data each name’s value should/must contain (URL, datetime, free text, text with restrictions…), and whether something needs to be the child of something else. Make up a URL on a domain you control, and ideally put your vocabulary specification there. Use the URL in itemtype="" to reference your vocabulary. There are, however, very good reasons not to make your own vocabulary. They can be quite hard to create, as evidenced by the work that goes into microformats vocabularies. For truly site-specific data, you’re fine with HTML5 custom data-* attributes, or using microdata the same way. But to really get the quasi-API benefits of microdata, you need to use a vocabulary that’s on more than just your site. To make a vocabulary like that, you need to cover not just your own needs, but 80% of the needs of everyone else in the same subject area. First, check out microformats.org to see if there’s anything in roughly the same area you can just microdata-ify. After that, try RDFa vocabularies. If you still have no luck, try collaborating on a vocabulary with other people in your subject domain. If you’re going to write your own microdata vocabulary from scratch, I’d recommend trying to write a microformat first, as you’ll get a lot of good feedback and they have good info on how to write one. It’s easy to then convert the resulting microformat vocabulary into a microdata vocabulary. But microdata is not the only way to extend the semantics of HTML5 and add extra meaning. We’ve already looked at Microformats, and RDFa is up next. Interesting. Are there any tools out there similar to the ones for microformats that you can use to help auto-generate the markup for you for microdata? I’ve often used tools like this http://microformats.org/code/hcard/creator as a starting point to do most of the heavy lifting and then I just go in and tweak the markup afterward. @Eric — http://html5doctor.com/microdata/#tools, specifically microdata.freebaseapps.com. Looks like I better add in-page navigation :) As with microformats you can write microdata by hand, but it can be tedious. I also think snippets or code generators are the way to go. Thank you for this article, and for your previous one on microformats and HTML5. My confusion about microdata persists, but I think I am making some progress. Thanks for sharing. A bit confusing and complex in the beggining, but gives the global overview on the subject. I’m sticking to microformats for the time being. The location microdata at id="location" will then be used in the event. Remember to add an in-page link to the itemref so that humans can get to the canonical info too! @Alohci — d’oh. thanks, fixed. It’s still a work-in-progress, but it already contains validation for most of Google’s data-vocabulary.org types. I have occassionally used Microformats on websites but I think you’ve shown me that Microdata would be a better approach especially when using HTML5. Microdata goes mainstream with Schema.org, supported by Bing, Yahoo and Google. If you’ve already implemented microdata (say, after reading this article ;) ) here’s a Rich Snippets to Schema.org migration guide. A very good and well explained Article about all this Microdata. Especially the part which explaining when values are taken from href=””, content=”” and other attributes like that was very helpful for me. I was watching about 10 other Websites and couldnt find this information there. Wondering why these guys dont pass this information, as from my understanding it’s an important part of Microdata. I need microdata for a poetry website — we have common entries like poets, their books, and references to some other books/stories (prose). @Animesh — it depends what you want it for. What do you hope microdata will do for you? I’ve a poetry website. The poem is in archaic language and is distributed as a GIF file in a custom script (unicode option doesn’t work very well for us). Most of the poems are excerpts from classic texts or books. We also translate these poems. – First few lines of the poem in unicode. – Specify first few lines of the translations. – The poet of the poem. – The book from which the poem has been taken. – Any information on current publishers of the poem or the book. – Classify the poem into genres (this might be useless for the search engines). Probably I am making more sense to you now, or not? @Animesh — To start with (and stating the obvious), any content you want search engines to read needs to be included as text. Just like a visually impaired user, search engines can’t read gif images. I’m sad to hear that Unicode doesn’t support all the glyphs you need, as that would make this much easier. However if you’re able to give the first few lines in Unicode, you can also include all of the poem’s text, even if it’s not perfect. I assume that there are some rules for writing your script in Unicode that deal with missing glyphs, so just follow those and do the best you can. Also ask about planned support for your script on a Unicode mailing list to find out about possible future support. If the issue is font support organise with others to create a free font you can then use via @font-face and offer for download. There’s nothing for the first few lines of the original or translation, but as I said above you really should put all of the original and all of the translation in as text. 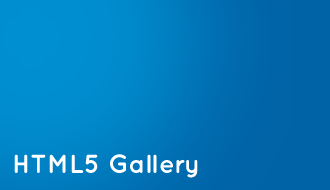 You can use HTML5’s standard lang="" attribute to indicate the language of the content. I cover this in passing in Quoting and citing with blockquote, q, cite, and the cite attribute. Great guide to Microdata! Love it! Opera drops teh awesum and becomes the first browser to support the microdata DOM API. Rock! I’ve updated “Extending HTML5 — Microdata” with info on schema.org, browser and tool support, and a clearer description of itemid. Thanks for the prompt Philip! Nice guide. It is saved me a lot of time. Are there any known negative effects or penalties that can be applied if oneself was to use the <meta> tag to define other properties? To me this holds potential for negative effects because essentially you’re putting hidden information into the webpage. yet on the other hand, you’re simply providing extra information to the search engines to help them provide better information to the user. @Matthew — I’m a little unsure of your question. re: your first paragraph, there’s generally no problem with only including some of a vocabulary’s properties. For example, checking with Google’s validator the requirements for schema.org vocabularies are surprisingly minimal (I haven’t checked with the schema.org list about this yet). Re: your second paragraph, it’s possible to extend a vocabulary, and schema.org has information on their “extension mechanism”. A couple of first principles: extensions to a schema.org vocabulary, or using a custom vocabulary, will not provide extra information to search engines, as despite being machine-readable microdata is opaque unless you know the vocabulary. The only thing it may do is give them an indication of popular data/vocabularies they should add support for. Also, while there’s no requirement for microdata to be connected with content on the page, microdata that isn’t will tend to metacrap. Any public vocabulary microdata value (schema.org etc) should be content. @ Dr. Oli Studholme – Thank you for your response. What i was hoping to get was an opinion on whether it is good or bad practise to use the meta tag to define an itemprop. I know that Google will not use content hidden via css display:none but does this apply to the meta tag? On a side note: I liked the comment about Metacrap. I watched a video on how it is very easy to provide fake data such as ratings through the use of microdata. I lost all interest as soon as I saw it using meta elements outside the document head, where it belongs. OK – I haven’t lost *all* interest, but it seems to me that if your content is properly presented so that your users can figure out what the smurf you are talking about, then a search engine should be able to as well. If search engines are written sloppily enough that they can’t and rely on Microdata to get it right, then this will be abused the same way the keywords meta tag was abused. SEO tricks that are dishonest and exist just to get users to a site hoping they click the annoying hover ads. I’ll have to look into it some more, keywords meta tag has legitimate use even though search engines ignore it now (I sometimes use them to benefit site specific search), maybe this could be of benefit in some respects to internal web app stuff, though data-* is largely what I use for that. @Mathew — I’ve hopefully fixed up your missing <meta>. Unfortunately we haven’t updated the commenting system yet, so you’ll need to escape < in code samples using &lt;. There’s no difference between adding an itemprop to <meta> or to another element (see sidenote), but you still generally shouldn’t do it as you’re making the data inaccessible to anyone but search engines. Opening hours are a terrible thing to put in <meta>. Google doesn’t treat <meta> as spam, but the info is only used to make your listing more informative, and will not affect rankings. Thanks! I was unsure for a while how to use anything that had multiple values(i.e. itemprop="keywords"). Great article! Now I’m use HTML5 Microdata on my site. Thanks for this comprehensive overview. How do you actually put or integrate the microdata into a webpage html. We sell products online, and I don’t know how I can use this microdata stuff on my website. Can you help? can itemref=”…” be used in a element? if yes, doesn’t this conflict with the fact that are supposed to have a content=”” attribute? can itemref=”…” be used in a <meta …> element? if yes, doesn’t this conflict with the fact that <meta …> are supposed to have a content=”” attribute? Well, no – but not because it’s a meta tag. itemref should surround a block of html which contains information about an item (ie your band members), so unless you are using a </meta> to close the tag, better stick to spans, divs, ps, etc. As to whether it will validate – that’s another question! IMHO, microformat is generalized parseable RDFa snippet that when nested into XHTML5, note the “X”, makes XSL transformation applicable, so serving hNews as atom feed maybe left to server & consumer of content has better flexibility with regards to consumption technique. Search providers just needed short-hand vocabulary for simpler parsing by their crawling bots as the transformations besides updating their indexing database benefit the consumer in the content providers’ interest rather than build the search providers reputations. So they used their monopoly over consumers thereby saving on parsing effort, by putting the onus on content provider for overloading the markup with their short-hand towards SEO, viz. the overly restrictive microdata that beyond schema.org’s vocabulary serves only academic fancy. I dare say with regards to being restrictive, microdata is anti-OWL of sorts. Vocabularies recognized to serve initial context are seen at http://www.w3.org/2011/rdfa-context/rdfa-1.1.html The prefixes are to the best of my understanding imported by using rel=”profile” to enable RDFa as mentioned at 1.4.1.3 in http://dev.w3.org/html5/rdfa/rdfa-module.html I experimented with Bing Webmaster Diagnostic Tool Markup Validation as well as Google Structured Data Tester & the result clearly shows lack of sportsman spirit towards non-schema.org vocabularies leading them towards becoming orphan step-children of semantic web. Dialects like gr & foaf & even individual microformats have precisely specific scopes whereas schema.org certainly aims to cause loss of context to the semantic content composer. The predecessors of schema.org that made it to W3Cs RDFa initial context & the prefix notation from RDFa are the minimum that major players should accommodate rather than harshly monopolise their implementation to interpret itemtype attribute, considering validator.nu as validator finds the markup to be valid. I’m sorry I couldn’t help myself. 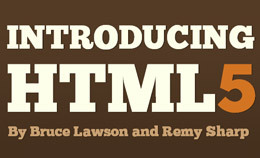 For those who like (to argue about) semantics, HTML5 is fantastic. For those who like [to argue about] semantics, HTML5 is fantastic. Thanks for this great reference. I agree with you, HTML is fantastic. We just converted our site from XHTML to HTML5 and are really enjoying the added benefits. Actually, we are using the Genesis Theme Framework and their latest version fully supports HTML5. Converting it was super easy and took less than 15 minutes. I wrote a tutorial to help other Genesis users make the switch and included a link to your site for anyone needing more information. I have a question. I have not built my client website which is in test form but have been given limited access to a series of three or four .php templates. I am clear (almost) in how to update the head of the template document but struggling with micro data. Is there a way of integrating the micro data into these templates to flag items like company name, name, address etc? Content wise the client is using an e-commerce plugin that allows us the add micro data seamlessly when they populate certain fields. I can cut and paste code if that helps. Thanks! Should the browser support table be updated with recent information. For example, Firefox has implemented it and there is a proposal for removing it from Firefox. And I’m not sure since the switch from Opera to Blink there is a support for it. Removed from Webkit, Removed from Blink. Seems a shame to me, but we manage perfectly well without a built-in API for RDFa, I see no reason why Microdata should be different. I do not understand. Microdata information is useful to bots, but we put it in html that is far more often served to non-bots ?? Why can’t we put it in an external file referenced with a <link /> tag, where it can be ignored by browsers that don’t use it and cached by browsers that do make some use of it? I really hate CSS and I think CSS needs to be re-written from the ground up. But one thing I do like about CSS is CSS selectors. If we put the microdata stuff in an external file, we could just use CSS selectors to specify where it should be applied. I think the current implementation of microdata is fundamentally wrong. Keep style and content separate. And microdata too. Hi Oli thanks for a great article! Not too long ago I have added Microdata markup to my website and found it strange that 99% of the websites out there hardly use any markup, and/or often (including the Genesis theme) full of errors. In fact it was VERY hard to find websites that had extensive implementation. Do you have an explanation for this? Is the learning curve to big, not worth the effort, has the initiative failed? Love to hear your opinion!